Sr. Judith Marie Blizzard's ministries have been in education, leadership, vocation ministry, formation, retreat ministry, and spiritual direction. 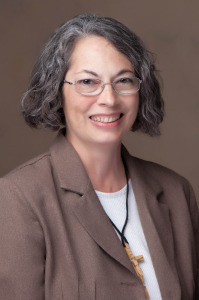 She is currently a spiritual director in the Pittsburgh area; is involved in evangelization, retreat ministry, and giving parish missions; and is also the mission leader for the Mooncrest Neighborhood Programs in Moon Township, Pennsylvania. Below is her vocation story in her own words. My family was a faith-filled family. Most were Baptist and some were Catholic; and we freely talked about God and God’s action in our lives. We debated at times over beliefs, but we all knew we loved Jesus and were grateful for that. My mom raised me to be Catholic and my Baptist father made sure my brothers and I received a good Catholic education, because that was what he and my mother agreed upon when they got married. Since third grade, I desired to be a missionary but never thought of being a religious sister even though I loved helping the sisters after school. By my senior year in high school, I had a clear idea of my life. I would get my college education to be a child psychologist, do missionary work for 2 years, find the man of my dreams, get married and have twelve children. However, all those plans were thwarted when my religion teacher, Mr. Kenney, asked me if I ever thought about being a sister. I honestly said, “No.” It was not part of my culture. My mom and grandmother prepared me for marriage and motherhood. However, I was disturbed by his question and it replayed in my head over and over again, so I asked him why he asked me. He said I enjoyed his theology class, I was always at Mass, and I was always volunteering for service at church and school. I said that was true, but that doesn’t mean I have to be a sister; I could be a faith-filled wife and mother. He invited me to a Saturday retreat about vocations at the convent. After the retreat, I felt confused. What I experienced with those Franciscan sisters was attractive and moved my heart. Months later, the Felician Sisters heard I was thinking about being a sister. That was not entirely true, but God was at work. They invited me to a “Come and See” each time one was offered. To my relief, I was never available, until that weekend in October when I had no excuses. I told myself I would go just to get them off my back. When I went and was praying before the Blessed Sacrament, I realized that this is where I was meant to be. I felt at home. I cried during the whole weekend. My tears had many sources—fear of disappointing my family and best friend; confusion that God wanted me for this when my life was on a different trajectory; peace at knowing I would be part of a community of women who loved and served God the way I desired. My mom sensed I would choose this life. She detected the vocation in me as well. She actually dedicated me to God when I was born because we both almost died when I was in her womb. Years later, when I was teaching high school as a Felician Sister, one of my students told me I would have made a great mom. I smiled and told her that I thought so too. God called me to this life and I am very happy. I don’t have my own children, but I have had the joy of mothering many children and people as a teacher, mentor and spiritual companion.